David Gallo is an American oceanographer and explorer. He was Director of Special Projects at the Woods Hole Oceanographic Institution – a preeminent, globally recognized scientific laboratory. For more than 30 years, David has been at the forefront of ocean exploration, participating in and being witness to the development of new technologies and scientific discoveries that shape our view of planet earth. He has been described by TED Conferences as “an enthusiastic ambassador between the sea and those of us on dry land.” With nearly 13 million views his TED presentation “Underwater Astonishments” has been among the all-time top TED Talks. David received Bachelor of Science and Master of Science degrees in geology from the State University of New York at Albany and a PhD in oceanography from the University of Rhode Island. In 1987 he joined Robert Ballard’s team at Woods Hole Oceanographic Institution as Assistant Director of the Center for Marine Exploration. David has participated in expeditions to all of the world’s oceans and was one of the first scientists to use a combination of robots and submarines to explore the deep seafloor. 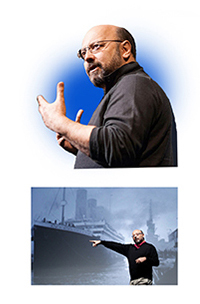 Most recently he co-led an expedition to create the first detailed and comprehensive map of the RMS Titanic. He also co-led the successful U.S. effort to locate the wreck site of Air France flight 447. He is currently involved in planning a series of expeditions to the Mediterranean on the trail of the Atlantis myth and an Antarctic expedition to locate the remains of Earnest Shackelton’s ship ENDEAVOR. Dr. Gallo remains active in encouraging the development of new technologies for ocean exploration. He is a member of James Cameron’s Deep Ocean Task Force and a member of the XPrize Ocean Advisory Board. He is dedicated to exposing young minds to the excitement and importance of exploring the ocean world around us. He is a member of the First Lego League Global Advisory Team, a participant in the Aspen Challenge (with the Aspen Institute and Bezos Family Foundation), and is a proud member of the United States Nifty Fifty Scientists and Engineers. David has become increasingly outspoken about the relationship between humanity and the sea. He feels strongly that instead of taking the oceans for granted we need to recognize the oceans critical role in providing the air we breathe, the water we drink, and the food we eat. At the same time, Dr. Gallo feels that human activity has impacted the ocean on a global scale and with significant consequences. The oceans hold the clues to our past and the key to our future yet they remain mostly unexplored and poorly understood. Dr. Gallo is personally committed to conveying the excitement and importance of ocean exploration to the public-at-large. He has lectured internationally to audiences ranging from children to CEO’s with the goal of awakening the little bit of Jacques Cousteau and Jules Vernes that resides in each of us. He has given 8 TED and more than 15 TEDx presentations and has appeared in numerous documentaries (Discovery Channel, History Channel, National Geographic). He has also been featured on numerous televised news programs (Weather Channel , PBS Need to Know, MSNBC Ed Show, NBC Today show, and Face the Nation and is currently a CNN Ocean Analyst. During July 2014 he was invited by the Court of Crown Prince of Abu Dhabi, Sheikh Mohammed bin Zayed Al Nahyan, to be the featured guest and speaker at the Ramadan Majlis. In recognition of his role in exploration and communications David is a 2014 recipient of the Explorer’s Club Lowell Thomas medal. He is a co-recipient of a Computerworld-Smithsonian Award, an elected Fellow of the American Association for the Advancement of Science, a National Fellow of The Explorers Club, a TED-All Star, and a recipient of the Lotus Club Distinguished Achievement Award.